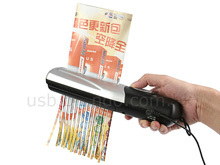 USB-Powered Handheld USB Paper Shredder | OhGizmo! By David Ponce on 06/14/07 • Leave a comment! There’s a wind of paranoia going around that compels us to shred all paper, should it contain incriminating evidence of something or other. Consequently, we’re seeing more and more paper shredders; some of them using esoteric energy sources like hamsters. But we’re fairly sure it’s the first time we see a handheld, USB-powered paper shredder. The fact that it’s powered through a USB port is sure to gain the attention of geeks worldwide. Aside from that, well, it doesn’t seem to do much else. If you’re looking for a cheap ($23), handheld, geeky and soon-to-be-available (mid-July) way to shred your (imaginary) lover’s letters, this may be your best option. Or… there’s always this weird thing our ancestors called “scissors”.